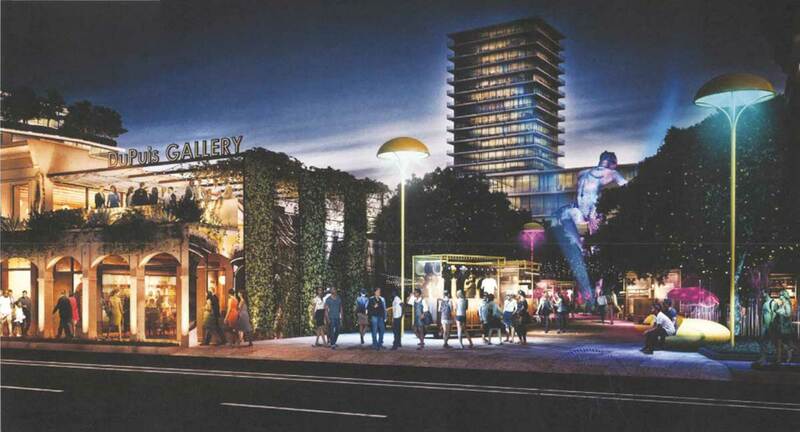 A sweeping mixed-use plan to bring jobs and investment to Little Haiti has just advanced twice on its way to Miami city commissioners. Magic City Innovation District is planned for more than 17 acres at 6001 NE Second Ave. The large project would be built in phases, as part of a Special Area Plan (SAP) under the city’s Miami 21 zoning code. The proposed SAP was recommended for approval, with conditions, on July 18 by the city’s Urban Development Review Board and later by the Planning, Zoning and Appeals Board. The multi-million-dollar project includes redeveloping the site with 2,630 residential units, 432 hotel rooms, 344,548 square feet of commercial-retail uses, 1,987,686 square feet of office uses, and 165,528 square feet, or about 21% lot area, of open space. Current site plans show the highest proposed building would reach about 25 stories and be in the center portion of the property, with shorter heights of new development fanning outward from the center. The developers hope to attract a railroad station to the property, as new passenger rail opportunities grow in the region. Attorney Neisen Kasdin represents the developers, MCD Miami LLC. In paperwork submitted to the review board, Mr. Kasdin said the proposed Magic City Innovation District SAP consists of 37 abutting parcels in Little Haiti, totaling about 17.75 acres. “Development within the SAP will be a unique mixed-use urban campus focused on local entrepreneurship and innovation in technology, the arts and entertainment, sustainability and resiliency, and health and wellness,” he wrote. “The proposed development program will create an integrated urban campus of residential, commercial, office, research and entertainment uses, anchored by 3.8 acres of public open/civic space, including a grand pedestrian central promenade,” Mr. Kasdin wrote. The project site is generally bounded on the north by the Little Haiti Soccer Park and Northeast 64th Terrace, on the east by Northeast Fourth Court and Northeast Fourth Avenue, on the south by Northeast 60th Street and on the west by Northeast Second Avenue. Mr. Kasdin said the largest portion of the site is the location of the former Magic City Trailer Park. He told the review board of the strong development team whose members include Bob Zangrillo, Tony Cho, Neil Fairman, and Cirque de Soleil founder Guy Laliberté. This project will be the intersection of technology, arts and entertainment, said Mr. Kasdin. Architect Bernardo Fort-Brescia of Arquitectonica said the property is home to many large mature trees that they are working to keep and incorporate into the new development. Another representative of the development team said they plan to keep about 100 trees and relocate about 80. “They are quite dynamic,” Mr. Fort-Brescia said of the mature trees on the property. Mr. Fort-Brescia showed an image of the former Lemon City pharmacy office building of Dr. DuPuis, which is to be restored as part of the project. The project has stirred some concern and opposition, with some people troubled by the size of the project and others worried about it adding to traffic congestion in the growing city. At the review board meeting, attorney Meena Jagannath a co-founder of Community Justice Project Inc., wanted her objection put on the record to the proposal being heard by both city review boards on the same day. Ms. Jagannath alleged the developers have sown division into the community, and she said the project being “fast tracked” was upsetting. She said the developers are offering a fairly weak community benefits package, and she asked that the matter be deferred. She said a broader community review of the project’s impact is needed. Ms. Jagannath said the plan is insufficient when it comes to traffic, infrastructure support needed, and impacts on the community including displacement. “This is a big deal,” said Neil Hall, acting chairman of the review board. Representatives of the developers’ team said there has been extensive community outreach, including three meetings that attracted 80 to 100 attendees. The developers have also been backing and supporting arts and music programs in Little Haiti, and sponsoring business leadership training programs. Review board member Gerald Marston said there seems to be a disconnect when it comes to community outreach. “You say there’s been no outreach, you say you have,” he said, gesturing to Ms. Jagannath and then the developers’ team. Regarding site plans showing the retention of trees and planned public walkways, Mr. Marston was complimentary. “You’ve created the pedestrian space in a wonderful fashion. As a master plan, you’re going in the right direction. I commend you,” he said. “We had this asset. We wanted to make it a focal point,” Mr. Fort-Brescia said of the trees and vegetation existing on the property. However, Mr. Perez mentioned, other large mixed-use projects are planned for the same general area, including Miami Jewish Health Systems and Eastside Ridge Special Area Plan. One of the developers, Mr. Fairman, said the Magic City Innovation District will serve to activate the Little Haiti neighborhood. “It needs the lifeblood of something new. We want to be a part of the community … this is our goal,” he said. At the zoning board meeting the night of July 18, Mr. Kasdin said: “I think you’ve seen, this has been as comprehensive a plan, as deep an outreach, and as innovative and thoughtful I think of an idea basis for creating a special area plan as any that I can think of in the city. The zoning board was considering two resolutions, which were approved on a 7 to 2 vote with modifications. The first is a resolution recommending approval of amending the city’s land use map by changing the future land use designation from “light industrial” to “restricted commercial” of properties at Northeast 61st Street, 62nd Street, 60th Street and Fourth Avenue, and by changing the future land use designation from “medium density restricted commercial” to “restricted commercial” of the acreage at 6001 NE Second Ave. The other resolution is recommending approval, with conditions, of rezoning some parcels for the development of about 17.75 acres for the Magic City Special Area Plan at approximately 6001 and 6041 NE Second Ave.; Northeast Fourth Avenue, Fourth Court, 60th Street, 61st Street and 62nd Street. The properties within the Magic City Innovation District are in Lemon City and Little River. All the properties fall within the official Little River Business District AKA the Little River Industrial District. Smart investors have been investing in Lemon City and Little River for over 20 years.